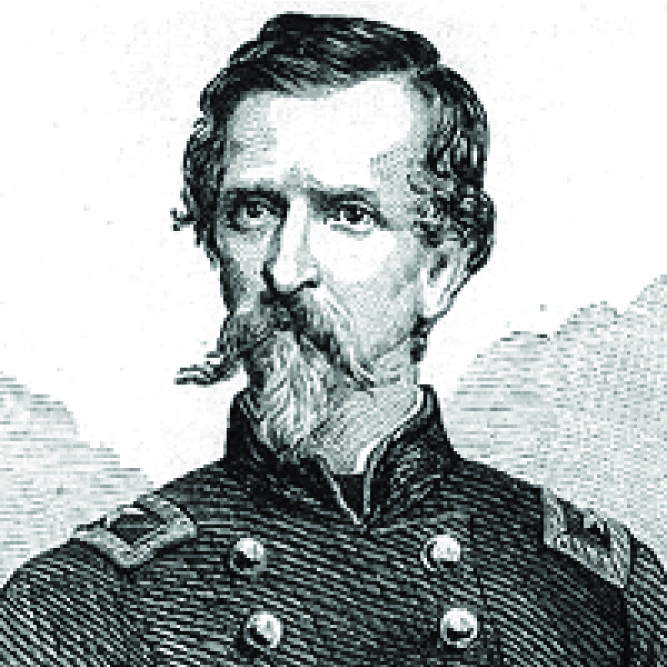 General Stephen Watts Kearny, Commander of the 1st U.S. Dragoons, Company C and Company K. His name of course was borrowed by the developers of Kearny Mesa. Preface: I have long been fascinated by Western movies, disaster stories and military and local San Diego history. The text reprinted here was found on the website for the San Diego History Center, which says it’s “dedicated to helping people of all ages learn about and enjoy the history of San Diego, and to appreciate how our past, present, and future are interrelated.” Visit it at sandiegohistory.org. A large cross on a hilltop south-east of where Interstate 15 crosses Lake Hodges north of Rancho Bernardo is where local lore says Mule Hill stands, overlooking the site of the battle site. The exact spot of Mule Hill has since come under dispute because General Kearny’s column left no specific detailed account of its location. Meanwhile the American troops under Gillespie and Kearny had joined forces near the present day city of Ramona, in the Santa Maria valley. Kearny’s men numbered about 150, including Delaware Indians with Kit Carson and African American slaves of the officers and drovers. 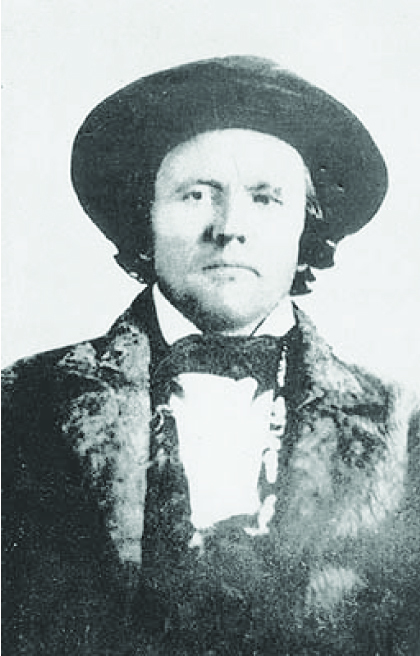 Gillespie’s party had thirty nine soldiers including Rafael Machado, a local Californio. The total American force was about 179. The Californios under General Andrés Pico had about 100 men. Famed frontiersman, Indian fighter, and Army scout Kit Carson. Years later he would be breveted a general, probably the only American to reach such a high military rank without being able to read or write, although he could sign his name. They also named a city park after him near Escondido. The American commanders debated whether to engage Pico’s troops at San Pascual or bypass them on their way to San Diego. Finally, over objections from some of the officers, Kearny decided to scout the Californio positions and sent out a party led by Rafael Machado, a local Californio deserter. Machado succeeded in entering the San Pascual village and learned of the Californio strength. But the American troops grew impatient with him and advanced making enough noise to wake people in the camp who came out “crying Viva California, abajo los Americanos.” Soon after that the Californios sent out a patrol and they retrieved a US Army blanket—proof that the Americans had been near. When this was discovered Pico ordered the horses retrieved from the distant pasture and the Californios to prepare for battle. Early in the morning of December 6, 1846, the American force charged the Californio army camp in the Indian village of San Pasqual. During the long charge the Americans became strung out in a long file, with those on stronger mules and horses far outdistancing others who were on tired mounts. The few gunshots exchanged were in this first charge, as the Californios met the early arrivals some distance from their camp. Captain Johnston was the first man to be killed. Then the Californios raced away being chased for about three-fourths of a mile. The Californio troops turned and charged at the Americans with their lances. It had been raining off and on for several days and Kearny’s troops had damp powder and had to fight with their sabres. The Californios were armed with long lances that they were expert at using in slaughtering cattle. In the hand to hand combat the Californios had the advantage of superior mounts, weapons and battle preparation. Only about half of the American force of 179 were involved in the actual battle. The rest were in reserve guarding their supplies and baggage. The Americans had trouble loading their newly-issued carbines with the small firing caps in the dark and cold. The two groups fought for about a half an hour mostly in the semi-dark and fog. Gillespie was struck twice. One lance threw him from his horse and another pierced his chest. According to one Californio account Andrés Pico engaged in hand-to-hand combat with Captain Moore. Another version put him and Leonardo Cota and Tomás Sánchez a mile away on a hill observing the battle. One Californio solider recalled that Juan Lobo, a twenty-three year old vaquero from Mission Vieja, led the main Californio assault on Kearny’s forces. During the battle the Californios captured one of the American cannons when the mules pulling it bolted and ran towards them. Finally the Americans brought up another howitzer which they fired at the Californios causing their retreat. Dead on the field of battle were nineteen American soldiers. Two more died later from their wounds. Kearny himself had suffered three lance wounds and temporarily relieved himself of command. The Californios had eleven wounded and one, Pablo Véjar, was taken prisoner. Juan Alvarado was wounded in the back by a rifle ball. Some American deaths may have resulted from friendly fire. Lieutenant Emory recalled finding the body of Captain Johnston; he had been shot in the head. He was the only American to be killed by a bullet wound. The American wounded were taken with the remnants of the U.S. troops to a camp on a hill near San Pascual. The dead were buried in a mass grave and a messenger sent to Commodore Stockton in San Diego to ask for help. The next day, December 7, Kearny’s troops resumed their march to San Diego followed by the Californios who constantly harassed them. When the Americans reached Rancho San Bernardo a larger group of Californios attacked them, and Kearny made the decision to establish a fortified camp on a hill. They were unable to advance further because of the wounded and the increased Californio attacks. On what became known as Mule Hill, the Californio lancers surrounded the remnants of Kearny’s and Gillespie’s command and because of hunger they were reduced to eating mule flesh, also they had no water. The Californios captured the messenger the Americans had sent to San Diego when he was returning and, under a flag of truce, he was exchanged for the only Californio prisoner, Pablo Vejar. Kearny then learned that Stockton was not able to come immediately because of the lack of horses. By December 8, 1846, the Americans decided to send out another party to inform Stockton of the urgency of their situation. One of the three messengers sent was a Native American, possibly from the San Pascual tribe. They arrived in San Diego after walking thirty miles and Stockton set out that same day to rescue the Americans. Meanwhile Pico received orders from Governor Flores to abandon his siege of the Americans and return to Los Angeles to rescue him from an insurrection from within the Californio ranks. So Pico and his men departed before Stockton’s led by Lieutenant Gray’s troops, arrived on December 11. Finally Kearny’s troops were able to move on toward San Diego in safety, arriving on the afternoon of December 12. Later General Kearny wrote that the battle of December 6th had been a “victory” and that the Californios had “fled from the field.” This view was challenged by one U.S. soldier, who wrote that they had been saved from decimation by the Californios’ capture of the American howitzer, an act that made the Californios “consider themselves victorious, which saved the balance of the command.” Later at the court martial of John Charles Frémont, Kearny admitted that the rescue party from San Diego had saved them from disaster. Generally the Navy officers, headed by Stockton, considered the Battle of San Pascual a defeat for the U.S. Army. Of course the Californios considered this engagement a victory and news of it spread throughout the district. Kearny’s defeat was a product of his overconfidence in the condition of his own men and an underestimation of the Mexicans will to fight. When in New Mexico, Kearny had expressed his contempt for Mexicans, writing, “the Mexicans are physically, mentally and morally an inferior and ‘low flung’ race.” The Californios for their part did not follow up their initial advantage. General Andrés Pico had divided his forces prior to the battle, not expecting to encounter Kearny’s troops. Moreover he knew that the Californios could not fight a conventional war. They lacked the military training, firearms and supplies. Under these circumstances the most effective tactics was guerrilla warfare. He wrote after the battle on April 15, 1847, “the morale of the people had fallen, due to the lack of resources… together with my compatriots we made the last efforts, not withstanding the extreme lack of powder, arms, men and all kinds of supplies.” The battle of San Pascual proved that despite internal dissention and division many Californios were willing to die to defend their homeland from the American invasion. Previous post: Fort Rosecrans graves of The Battle Of San Pasqual. 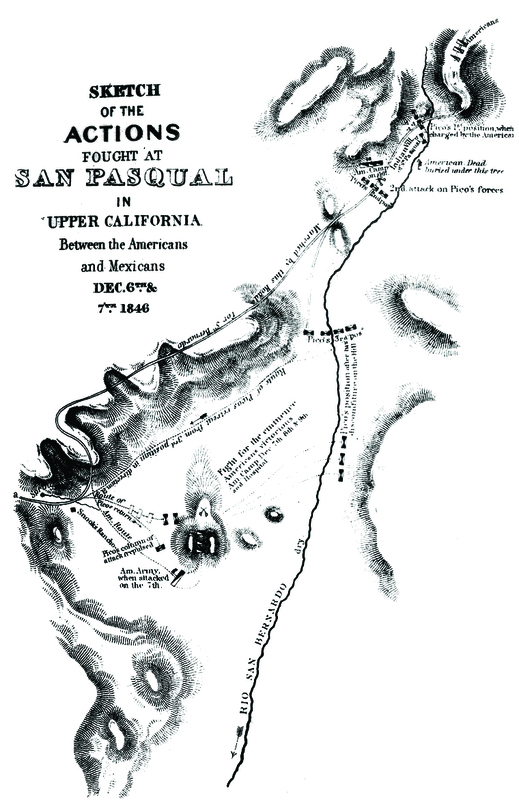 Relatively contemporaneous map of the Battle Of San Pasqual.